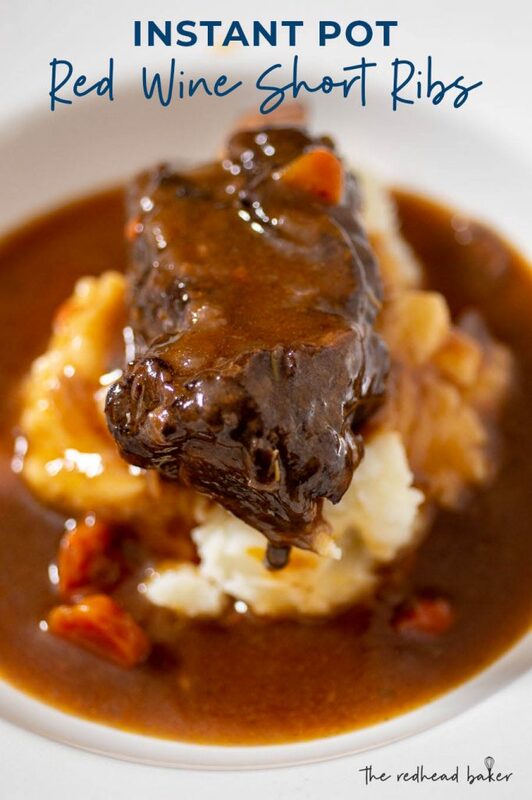 Short ribs served with rich gravy over mashed potatoes is a classic comfort meal on a cold winter day. An Instant Pot makes them fall-off-the-bone tender in just 45 minutes. Want to make this recipe on the stove-top? Get the instructions in my Red-Wine Braised Short Ribs post. There are some recipes that I make that I love. That I still think about days, weeks, even months later. Red-wine braised short ribs are one of those recipes. It’s a really rich, filling recipe, one that I only make on the coldest of winter days. Even when there is no short rib meat left, the sauce and veggies are almost like a thick soup, delicious when sopped up with a piece of hearty bread. As I linked above, I’ve made this recipe before, in my Dutch oven on the stovetop. Since that post published, I caved to peer pressure and bought an Instant Pot. I wasn’t sure what I would think of it. Well, since then, I’ve made some delicious dinners that I had previously put off due to the time involved. You can’t decide at 3 p.m. on a Sunday evening that you’d like to have barbacoa tacos for dinner that evening if you don’t have a pressure cooker. And unlike a slow cooker, you can do all of your searing and sauteeing right in the Instant Pot. Geez, this is starting to sound like an ad for the Instant Pot, but honestly, I just really enjoy using the appliance. These short ribs came out just as fall-off-the-bone tender as if they were simmered all day on the stovetop. I didn’t do the degreasing step that’s listed in the stovetop version, and next time I probably will, but other than that, I can’t wait to make these in the Instant Pot again! Turn your Instant Pot to saute mode. Once hot, add 2 tbsp of olive oil. Season the short ribs on both sides with salt and pepper, and saute them in the Instant Pot until they no longer stick to the bottom, then flip and brown the other side. Remove to a plate. Add the remaining olive oil, and saute the onion, carrots and garlic until soft and the onions are slightly translucent. Add 1/4 cup of the red wine, scraping the bottom of the pot with a spatula or wooden spoon to release the bits stuck to the bottom. Add the remaining wine, beef stock, tomato paste, rosemary leaves, and bay leaf. Place the lid on the Instant Pot, turn the valve to "sealing" and set it to pressure cook for 45 minutes. Let the pressure release naturally for 10 minutes, then carefully move the valve to "venting" to release remaining pressure. Use tongs to remove the short ribs to a plate. In a small bowl, mix together the cornstarch and beef stock. Turn the Instant Pot to saute mode, and bring the sauce to a boil. While stirring, slowly drizzle the cornstarch mixture into the Instant Pot. Continue stirring until the mixture thickens. Boil the mixture for 1 minute to cook out the starch taste. Place one or two short ribs on a plate, and ladle some of the gravy over top. I made the red-wine braised short ribs using the Dutch oven method and they were delicious. Thank for this wonderful recipe.